This recipe is free from: gluten, dairy/casein (option), soy, peanuts, tree nuts, corn. In a mixing bowl, combine berries, sugar, zest and flour; toss to coat berries. Spoon fruit into prepared baking dish. In the same mixing bowl, whisk dry ingredients for the topping. Cut in the cold butter with a fork until coarse and crumbly. Add egg and vanilla; stir. The mixture will be thick. Spread the topping batter over fruit (use the back of a large spoon to spread it – be patient – the batter is thick and spreading slowly is best). Sprinkle the 1 Tablespoon sugar over the top of batter. Bake 25 minutes, then check the cobbler. If it is becoming too brown on top before completely done (the center will appear dry, golden and a toothpick should come out clean when inserted in center), cover with foil and bake an additional 10 minutes, then check again. 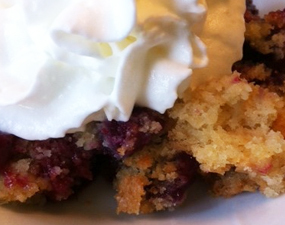 When cobbler is done, remove from oven (remove foil covering if used) and cool slightly before serving. Top with dairy-free whipped topping or your favorite dairy topping or ice cream. For substitutions please see Ingredient Substitutions for Gluten Free Gigi’s Recipes or Substituting Gluten-Free Flours and Starches.